I lost the 2.8 pounds I gained on vacation. This past Saturday, I was down exactly 2.8 pounds. Ha! I ate mostly vegetables. I had a lot of salads. We only went out to eat twice during the week and both times I had a salad. At home, I had either a salad for lunch and veggies for dinner or visa versa. I had chicken, too. And one day I had a hamburger and fries. Drank LOTs of water. With just about every meal I had broccoli. In Joel Furhman's book Eat to Live: The Amazing Nutrient-Rich Program for Fast and Sustained Weight Loss, he says broccoli has more protein than steak. What do you do to lose weight in a hurry? Any special tricks or tips for us? P.S. I've lost a total of 18 pounds since January first. Slow and steady wins the race! So I was mentioning before about trying to figure out why we gain weight back after we've lost it. I've been reading a lot about it and have found that one of the biggest factors for weight gain, after loss, is for the weight loss to be rapid. The article about the Biggest Loser winners who have all gained most if not all of their weight back, quoted a study done by the Obesity journal stating the reason why the contestants gained their weight back was because their metabolism was wrecked (basically). Here's a link to the actual study. It's pretty interesting. But I did NOT lose my weight rapidly. In fact, it took me almost FIVE years to lose 100 pounds. That averages out to be about a third of a pound a week. Granted, my weight loss was absolutely never steady or regular. But it was by no means rapid. I think there's something to the study on the Losers and the correlation to them gaining it back after rapidly losing it. But what about the rest of us who are sensible? Our minds are prone to forming routines. Read Charles Duhigg's new book The Power of Habit (I've just started reading this book) and you'll see our brains are hardwired to create paths between neurons as a way of learning and adaptation. Take a look at this video from his website. For me, my body craves these delicious things because I've trained it to. It was a learned habit I created when I was a child that I've been practicing at my entire life. I have build a habit within myself, of my own volition but entirely unintentional, to make myself crave the foods that are bad for me. So I'm doing this to myself? Well, of course it's NOT as simple as that. But I think I might be headed in the right direction. What do you think? Why is it we are predisposed to eat bad food, gain weight, lose weight, but still go back to eating the foods we love (and packing on the pounds)? Why do we gain after losing? Why do we gain the weight back after we've lost it? As I mentioned before, studies show the odds are stacked against us. If we lose weight, chances are we're going to gain it back. So what's up with that?? NBC News says it's because of a "too restrictive" diet. They quote the Obesity journal that says if people follow a very low-calorie diet, they'll regain significantly more weight back. Danny Cahill now has to eat 800 calorie less than a typical man of his size. If he eats any more calories than that each day he'll gain weight. Well, there's proof, even if it's just one man, who proves the theory of rapid weight loss leads to gaining all of it back. Yet here I am, FIFTY POUNDS heavier. I have already lost almost 20 pounds since the first of the year, so realistically, I gained SIXTY POUNDS back. So why did I gain almost all of my weight back? Why even try to lose weight?? Why do we gain weight back after we lose it? NBC News says "more than 80 percent of people who have lost weight regain all of it, or more, after two years." When I first got life insurance, I was about half way through my total weight loss and because I had been losing weight, they had to give me a higher premium as if I was heavier and unhealthier than I actually way. They said it was because of the same thing that NBC stated. I had to wait until about a year after I got to goal before I could get my life insurance premium reduced. So science proves that we will regain all or most of our weight once we lose it. Why even lose weight if the odds are against you. If you know there's a strong possibility you won't be in the very small percentile who will actually keep it off, why try? I mean, I don't know about you, but if the odds are against me in a negative way, I'm sure to win (or rather lose) every time. But here I am, 50 POUNDS HEAVIER than I was at my lowest on Weight Watchers (in 2010). What about you? 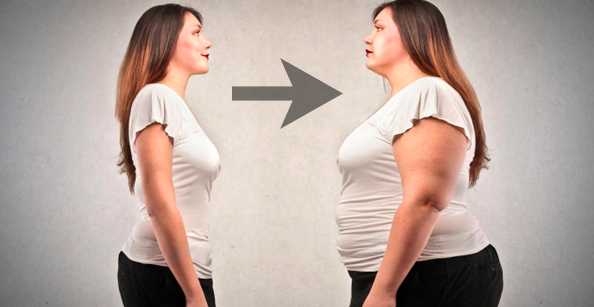 Have you lost a significant amount of weight and then gained all or most of it back? Or more? I had a rough weigh-in last week. I gained 2.8 pounds but the worst part was I was completely shocked about it. You know how sometimes you gain weight but you expect it. Maybe you cheated a little too much during the week and you know you're going to be up. But I was thrown off guard by this gain. Two week prior to the weigh in, I was on a week-long vacation where I indulged a little. Not much, but 3 nights I had dessert and 4 days I ate things I normally wouldn't. All-in-all, not horrible. I was expecting to gain a few pounds from this eating behavior. I didn't weigh in after I got back from vacation because I knew I'd be up a few pounds, so instead I hunkered down and stayed on plan for the next week. The thought was that whatever few pounds I gained while I was on vacation I'd be able to get off over the course of the following week. Maybe I gained more than a few pounds on vacation. I didn't weigh myself when I got back, I don't weigh myself at home any more. Only at Weight Watchers. What if I gained several pounds? What if I gained 10 pounds? Over the course of just ONE WEEK?!?! Is my metabolism so screwed up from all of the dieting (lose weight, gain weight, lose weight, gain weight....) that it no longer knows how to gain just a little bit from indulging? Do you think this might be what happened to me? Well, it's been a little over 4 years since my last blog post. Actually, I had posted a few times since then, but when I switched my blog to Wordpress.org, I lost them when the server went down. So I'm back on Blogger, now, and so happy to be home. As for my weight loss, well, I'm pretty much at the same weight as what my last blog post below states. I'm about 5 pounds less than what it states. Pretty sad because I've been on two different weight loss programs since that post. I lost 30 pounds on one and I'm on the second one now. I'm actually back on Weight Watchers. I've been technically back on WW since last August, but from then to January of this year, I managed to actually gain 2.4 pounds. I got serious about WW in January of this year and so far I've lost about 18 pounds. Well.... that was until two weeks ago. Long story short, I went on vacation and somehow managed to gain 3 pounds back. What the heck?!?!? But, here we area gain. I'm happy to be back to blogging. I'll fill you in on some of my shenanigans in the posts to come. For now I just wanted to say I'm back and you'll be hearing more from me on a regular basis. How have you guys been? Is there anyone out there still following my blog? I wouldn't blame you if I'm a long past memory for you, by now. But if you're still out there, leave me a comment and let me know how you're doing. I'll have to visit everyone's blogs again so I can get caught up on everything that's happen over the past 4 years. I'm looking forward to getting reconnected with everyone again. You guys were SUCH an inspiration to me. Tell me how you're doing! ...is how much I weigh, now. 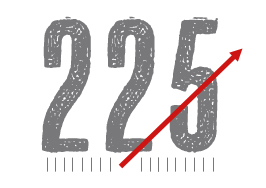 I have put it off, and put it off, and put it off, but I think I need to start doing something about that number today or that number will be right back up to 275 in a heartbeat. Actually, going at this rate, I'll be back up to 275 by Christmas. 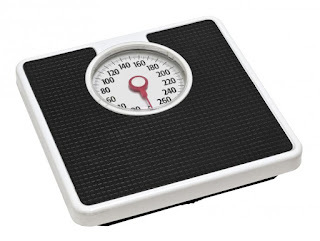 If I did my math right, I've gained a total of 35 pounds since my last blog post in September. I have to say this about that, though, I don't feel that bad (physically) about the extra poundage. I mean, my cloths are tight and I'm a bit uncomfortable in my jeans, but overall, I don't feel horrible. I don't feel as bad as I thought I would. But I know if I don't stop eating whatever I want, all my hard earned weight loss efforts will be for nothing. It took me 4 years to lose 100 pounds. I've successfully (gulp) gained back 50 of those pounds over the past two years. And I will not gain another 50 pounds! Why does weight loss have to be so horribly hard?! That phrase, I think, will be my epitaph. Well, I'm not sure where I'm going to go from here. What path I'll take. What my plan of attack will be. But I just wanted to blog about that number. 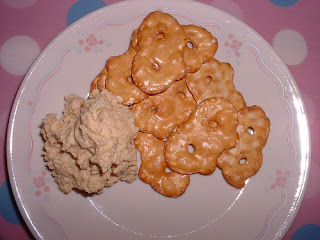 Don't you love it when you find a new snack or type of food--that you love--and it's healthy? It's funny how your tastes change over the years. A few years back, I would probably have thrown up if I had eaten hummus. I mean, it looks like baby food. Smells bitter and sour. And the texture, don't get me started! But man it's really good! And it's high in protein and fiber--bonus! I've been eating it lately with pretzel flats. I swear I could eat a whole tub of the hummus in one sitting if I allowed myself. It's quickly becoming a red-light food. But as long as I can put the bowl down after only 13 pretzel flats, I think it'll be okay. So I have a question for you... do you like hummus? Have you ever tried it? What do you like to eat it on or with? I need more ideas of how to eat this stuff!